There were a series of older buildings along Woodward Avenue in Ferndale housing the Jim Ashmore rental business. A few months ago they moved out to make room for the "Woodward Ave Lofts" -- over priced condos. As they raised the buildings, they left one (I assume waiting for the contract on the billboard over the building to run out). 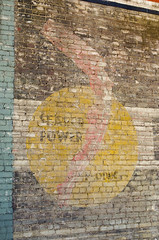 I loved seeing the old sign painted on the side of the building revealed as the other buildings were removed. I recognize this logo but can't place it.